Quickie hair lesson: Hair breakage is when locks turn brittle and break into varying lengths, while hair fall is the natural shedding of the entire hair strand from the bulb root. Hair fall of up to 100 strands a day is considered normal, while anything more than that is when you should start panicking. 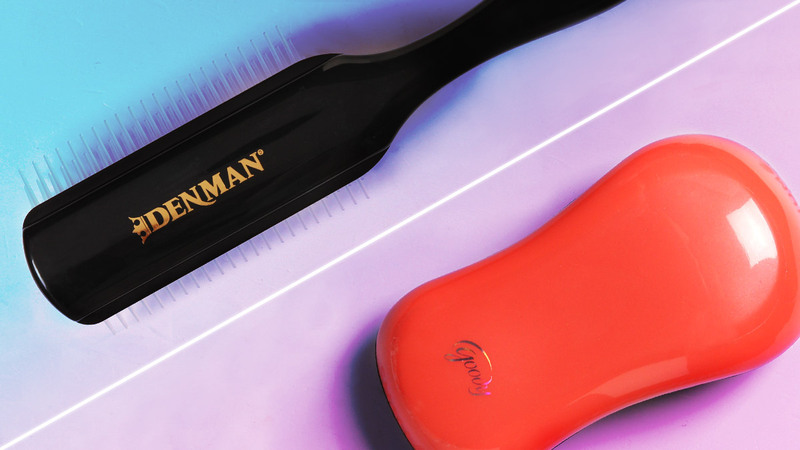 With that in mind, I decided to test two hair brushes—the Denman Large Styling Brush and the Goody TangleFix—to see which one can detangle my thick and curly tresses with as little hair fall and breakage as possible. I used both brushes after taking a shower for two days while my hair was still wet and didn't have any leave-on products! 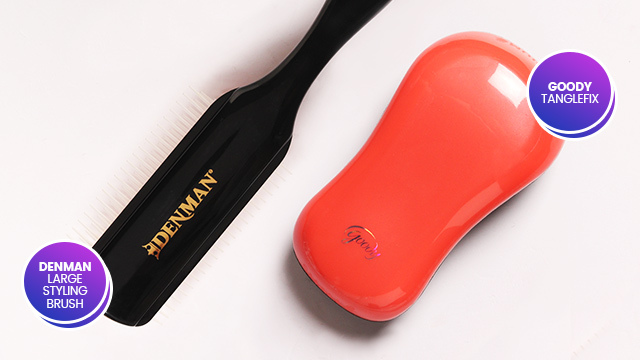 This classic hair must-have provides an anti-static rubber pad to provide grip and control when styling your locks. Results: I'm not going to lie; this was a little painful to use on wet, curly tresses. While it did eventually detangle my entire mane, I had to do it with extra care and effort. What I liked about it was that the bristles were long enough to reach and massage my scalp. This brush would work better on straight hair. Hair count: After thoroughly brushing my wet curls, I collected about 25 hair strands. It was a mix of both broken strands (hair breakage) and strands from the roots (hair fall). 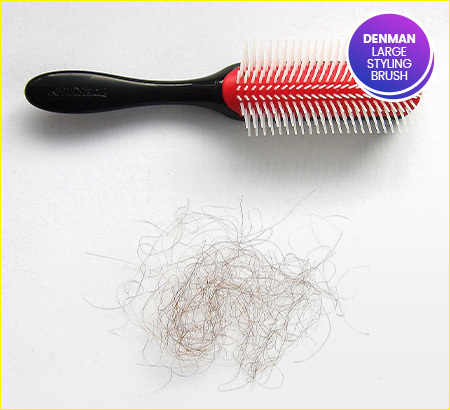 A gentle hand-held brush with flexible bristles that easily gets through tangles and knots in your hair. Results: This brush was ouchless—there was practically no snagging, even with my knotty, curly mane. Compared to other brushes and combs I've tried before, it gently detangled my extra thick hair with its soft, short bristles. Plus points for its cute, travel-friendly size! Hair count: After thoroughly brushing my freshly-washed curls, I collected about 12 hair strands. It was mostly strands from the roots (hair fall) and only a few broken strands (hair breakage).